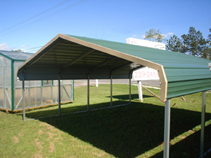 Carports are available in the classic carport style eves, or A-frame style boxed eves. We have sizes form 12' x 18' to 40' x 40' and up. We delivery and setup within two weeks of the order. You can chose a carport/storage building combo. Leg heights from 5' to 12' . 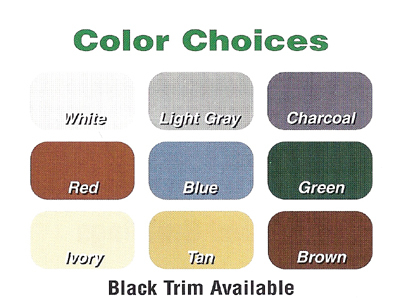 Chose for nine colors, with contrasting or matching trim. Special RV Covers are available. To increase the height, add the amount in the below table to the base price. *Note; wall heights are approximately one foot higher that the leg height. 6 Ft. Std Std. Std. Std. Std. Std. To have both sides enclosed add the amount in the below table to the base price. To enclose one end add the amount in the below table to the base price. To enclose both ends add the amount twice. To enclose one gable add the amount in the below table to the base price. To add a rollup door add the amount in the below table to the base price.